Easily cut through hard or soft cheese with the Progressive Non-Stick Cheese Knife.ÊThe built-in ridges smoothly slice cheese without the issue of cheese sticking to the blade. Sturdy plastic blade is sharp enough for thin slices of cheese yet safe on fingers. Slice open the plastic packaging around cheese using the built-in steel blade at the end of the handle. 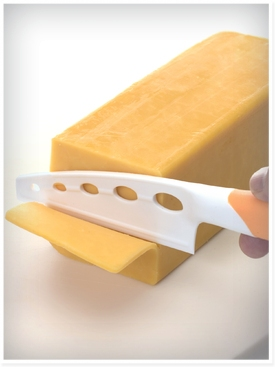 Cheese knife has non-slip grip coating on handle for comfort during use. Great for use with hard-boiled eggs, cakes, butter and other foods that stick to standard metal blades. Dishwasher safe.